When searching for the « best » gluten-free pizza dough recipe, dear neighbors, it all depends what you are looking for, I suppose. I personally wanted something fluffy with a crusty bottom, a little fiber (before going gluten-free my homemade pizzas used to include some whole wheat flour) and with no funny after taste, please. After some five plus years of disappointment I had almost given up. Rule number 1 : NEVER give up ! Somehow I finally nailed it down a few months ago, after cassava flour was once again available at my organic food store. What came as even better news for me was when my daughter, who lives thousands of miles away from me, doesn’t always find my ingredients in her nearby stores (in this case, she had to order cassava flour online and didn’t have any psyllium husk), bakes in a gas oven (I have an electric one) using funny Fahrenheit temperatures 🤪, still tried it out and loved it ! So here it is. I won’t get into the toppings ; they are for you to choose. * My original recipe, born in my French kitchen, included sulfite-free potato starch. For a recipe made in the U.S. I contacted Bob’s Red Mill to get information on their starches. The bad news : their potato starch must be avoided if you suffer from high sulfite sensitivity. The good news : it seems that since 2014 they have changed the way their products are manufactured , and according to their answer (click here for full details) all their other starches are sulfite-free ! Anyway, before I posted this recipe, I knew I had to test a version of the dough with arrow-root. Verdict: my husband loved it. I am not as convinced as he is, I think I should have used a little less and compensated with a little more teff, for less wetness. Or maybe I didn’t measure the water amount correctly — I am not exempt of making mistakes, dear neighbor! If there are any updates I will let you know. 2. Meanwhile, mix the dry ingredients. Potato starch is nice in a bread dough but it tends to be lumpy, so don’t hesitate to break the lumps with a spatula or a fork when combining with the cassava and teff flours. Also beat the egg white or chick pea juice into soft peaks (do not overdo it), and generously lather the parchment paper lining the tray on which your pizza will bake with olive oil. 3. Beat the activated yeast and leftover water into the dry mix (flours, starch, salt and binding agents), adding the beaten egg white / chick pea fluff last. Beat for about 2 minutes. This can be done in a stand mixer if you have one. You should end up with a batter that resembles a thick and sticky American pancake batter. 4. Spread the batter onto the oiled parchment paper with a rubber spatula and proof in a warm place for about an hour. (Use this time to prep your pizza toppings). When small bubbles start forming just below the surface, the dough is ready to be baked. Preheat your oven to 200°C fan-forced / 415°F non fan, setting the rack at a higher level than normal, slightly higher than half way. The dough CANNOT be garnished as is. It needs to bake as is for 2 to 3 minutes max, just enough time for it to set. Remove the dough and change the oven setting so that no heat will come from the top at a higher temperature ( 210°C fan-forced / 435°F non fan), moving the rack to the lowest level in the oven. The pre-baked pizza barely changes color. Quickly garnish your pre-baked pizza dough, return to the oven and bake an additional 12 to 15 minutes at that low level. Check the bottom of the pizza for desired crustiness. I don’t believe this recipe qualifies as a difficult one, once you have the ingredients. What do you think? Basically, in less than two hours you can have a piping hot, homemade gluten-free pizza on your plate. So long, dear neighbors! Ta-dah! One side of the pizza had real “mozzarella di buffala” topping for my husband, and local cheese for me. 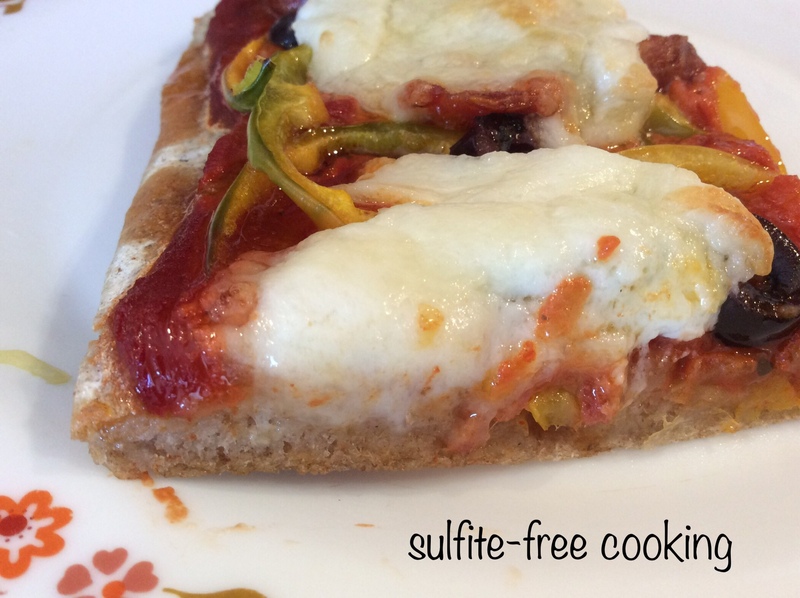 This one was made using sulfite-free potato starch purchased in Europe. Previous quinoa and vegetable medley curry with chicken or shrimp, and a nutty season for a nutty neighbor!